On Sunday I made roast chicken with a delicious pork stuffing. I had my uncle and aunt over, and along with my mother so there was just about enough leftover chicken to make a risotto. However, there was masses of stuffing, still succulent from roasting in the chicken so I decided to make stuffing balls and try it with something completely different. The end result made an excellent Monday night supper - quick and easy and can be on the table within 30 minutes. My sort of meal, basically. 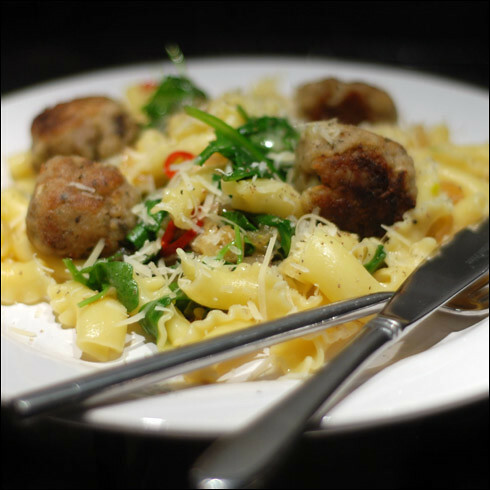 If you're vegetarian, just leave out the stuffing balls - I think the pasta with chilli, spinach and rocket is absolutely delicious in its own right. Put the water for the pasta on to boil. While you're waiting for it to boil, make the stuffing balls. Take a teaspoon of stuffing and mould it into a ball with your hands. Dust with flour and set aside. Repeat until all the stuffing mix is gone. I found I made 8 balls. Next, peel and thinly slice the onion and garlic and slice the chilli, taking care to discard any seeds. Heat some olive oil in a saucepan and gently fry the onions until soft. Add the garlic and chilli and fry for a further couple of minutes. Turn off the heat, add half the spinach and rocket and cover with a lid. The water for the pasta should now be boiling, so add the pasta and set a timer as per the cooking instructions on the bag. When you've got about 10 minutes left, heat up some oil in a frying pan and add the stuffing balls. fry gently, turning occasionally until the stuffing balls are golden. Just before you drain the pasta, add two dessert spoons of the pasta water, the lemon juice and the remaining spinach and rocket to the wilted spinach and rocket. Drain the pasta and transfer to the pan with the vegetables in it and mix well. Stir in half the parmesan and serve onto plates. Put four doughballs on each plate on top of the pasta and sprinkle the remaining parmesan on top. Serve immediately.